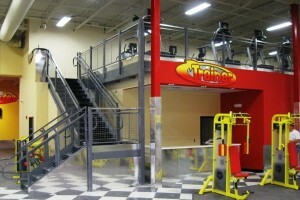 Is a Health Club Mezzanine Right for Your Gym? Is your health club or fitness center in need of extra space for more exercise equipment? Are you looking for alternatives to avoid a costly relocation? If the answer is yes, a health club mezzanine from Grace Material Handling is the perfect solution. 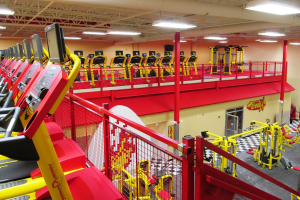 As a premier provider of health club mezzanines, we have worked with many gyms and fitness centers to add the extra space that they need to keep their customers happy. As the fitness center market continues to get more competitive, your clients will compare your club to others based on the amount of innovative equipment, classes, and other services that you provide. Don’t let a lack of space keep you from beating out the competition! Contact our mezzanine experts to learn more about how you can stay ahead of your competition with a health club mezzanine. We’ll make an on-site visit to your location and discuss your options with you and then provide you with recommendations and a price quote. If you decide to move forward with the project, our installers will work with your busy schedule to make sure the installation is done with minimal interruptions to your business. We know your clients are valuable to you, and we will work to make sure that effect on business is minimal if anything at all. For example, we recently worked with a customer who wanted the installation to be completed over the weekend to cause minimal inconvenience to their customers. Our team had the material delivered on a Friday evening and the installation was completed before business started on Monday morning.